In the case you are wondering, the skinny jeans appeared into the 80’s. This type of jeans is still trendy for many years now. Obviously, almost any piece of clothing is important to be worn according to your body shape. If that is your case, you are very lucky and… a model. Yes, indeed, in this happy case, the combos that you can do are great and very easy to create. It is basically indicated to choose light colors and you should avoid wearing too much black because it will make you look even skinnier that you are. 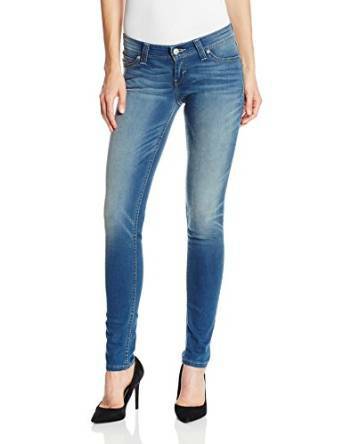 In the case you are having wide hips, your main issue is that when you are wearing skinny jeans it is obvious the contrast between the line of your thin legs highlighted by the skinny jeans cut and the wide hips you are having. You should cover the hips with a cardigan and that’s all, problem solved. If you have thick ankles, you should not wear cuffed jeans above your ankles. You can eventually choose a pair of skinny jeans that are a little larger at the ankles. Your purpose should focus on making your legs look longer especially with the help of the chromatic effects. An example in this respect is to wear a top that has the same color as the jeans. Or, you should consider choosing to wear a pair of jeans with a high waist.